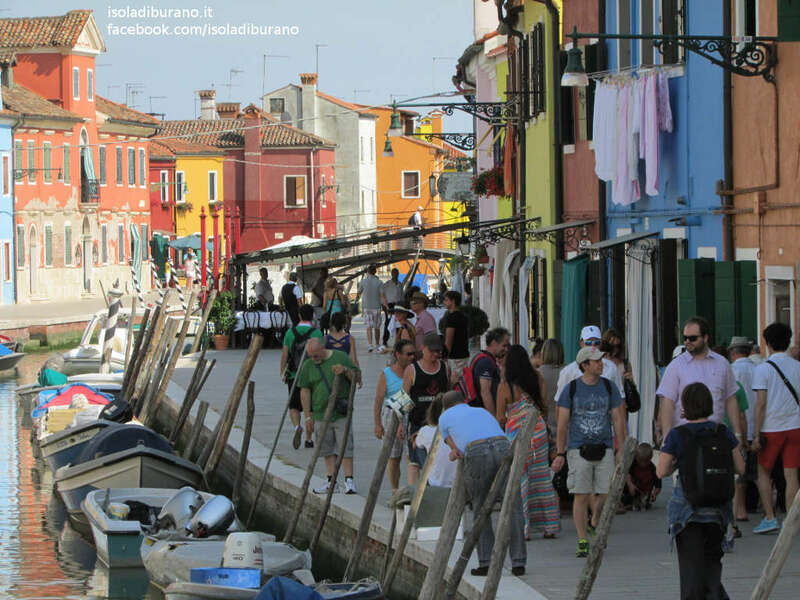 Welcome to isoladiburano.it the Official Website of Burano in Italy, the colorful island of lace. 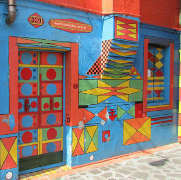 Home of big artists like Baldassare Galuppi, Remigio Barbaro and Pino Donaggio, as well as inspirer of the Arte Buranella. 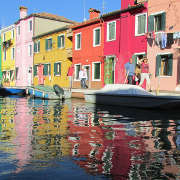 Many international magazines include Burano among the top 10 most colorful cities in the world, although it would be more appropriate to bring it within the first 10 most colorful places in the world or between the 10 most colorful locations in the world. Tour of Burano. From left: Burano's colors reflected on the green water of the canals, coloured houses of Burano, a half red and half green house in Burano. 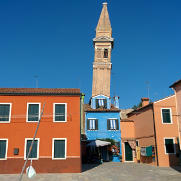 From left: the leaning tower of Burano, the square of Burano and the leaning tower behind the church. 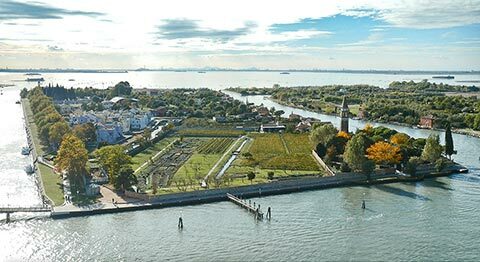 Just gone ashore from actv ferry (purchasing Burano's water bus tickets), you will be in a green lawn where a Remigio Barbaro's solemn sculpture is placed. Pursuing the shores you will arrive to center of the Island: Galuppi Square; here neighbourly ladies invite the most curious visitors to come into their shops to admire the lace working. Although in lacemaking in Burano is the main craftsmanship attraction, enchanting is also the "lume glass working": a technique born in the nearby island of Murano, but also widespread in the other islands of the Venetian Lagoon. Burano is not an exception to this and it is quite easy to come across some little shops where you can admire this type of Murano glass processing. Real glass factories in miniature, such as the shop located in Fondamenta Giudecca 132, inside a typical and small green house. If you search for a place to eat like a local, Burano is very famous for its fish dishes, the most famous of which is the "risotto de gò": the broth in which the rice is cooked and creamed is extracted from the "gò" a fish typical of the Venice lagoon, known in English under the name of "goby". The dishes of the Burano's cuisine are served in restaurants, who despite being known from the point of view of the quality of the service, in the kitchen maintain the genuineness of a typical old "trattoria buranella" (a Burano's tavern) and where you can still eat delicious fresh fish. If your time is short, there are anyway several pizzerias or you can opt for a delicious icecream in a bar or a typical Burano's cookie (the most famous are the "Bussolà" and the "Esse") in a pastry store, enjoying it until the end of Piazza Galuppi where San Martino Bishop's Church is located: inside, in addition to a lot of important works, there is a famous opera of Gian Battista Tiepolo. Sideways is located the Santa Barbara's Chapel. 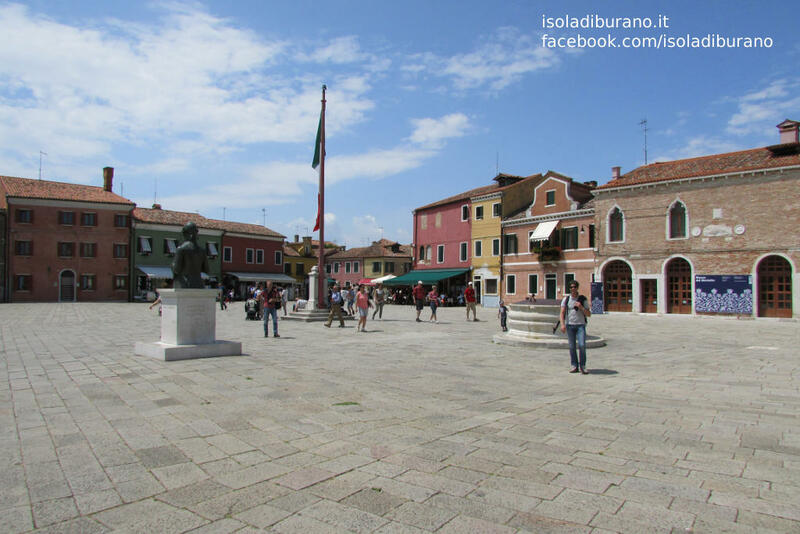 Always in the same square there is the "Museo del Merletto" (Lace Museum), the Town Hall, a well made of Istria's stone and the Baldassare Galuppi's sculpture made by Remigio Barbaro, the well-known sculptor from Burano. Sideways the church, some stands offer local souvernirs for a cheap price. 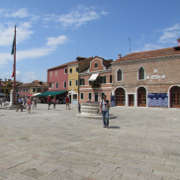 Moreover every Wednesday morning not far from the church the street market takes place and two minutes far from the center you can take a look at the fish market, where to see the typical venetian lagoon sea-food. Among Burano's tiny streets there are a lot of "capitelli" (capitals) placed in the calli entrances and, searching for them, surely you will bump into the most famous and coloured house in the island: "la Casa di Bepi Suà" (the house of Joseph Sweaty), painted with the use of many colors, divided into geometric shapes. 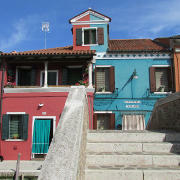 From left: the famous and colorful Bepi's house in Burano, Balssare Galuppi Square of Burano, the Burano's lace museum. 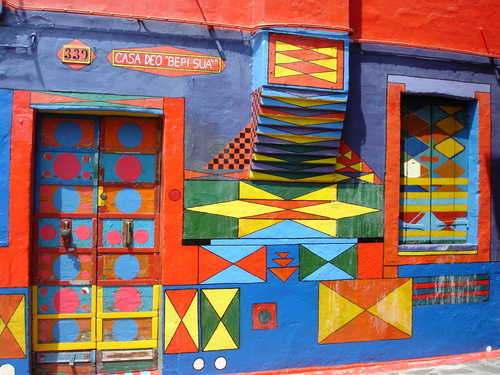 The typical Burano's houses are mainly squared-shaped and are divided into two or three floors. At the low ground there is the kitchen, the breakfast nook and the toilet. At the next floors there are the bedrooms. The different colours of the houses, which today rappresent the our island main feature, at a previous time was useful to delimit the properties. Notwithstanding an ancient legend narrates that fishermen painted their houses to see them from long distance when they were far away for fishing. 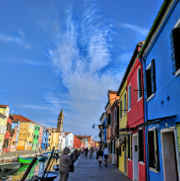 Where is Burano in Italy? 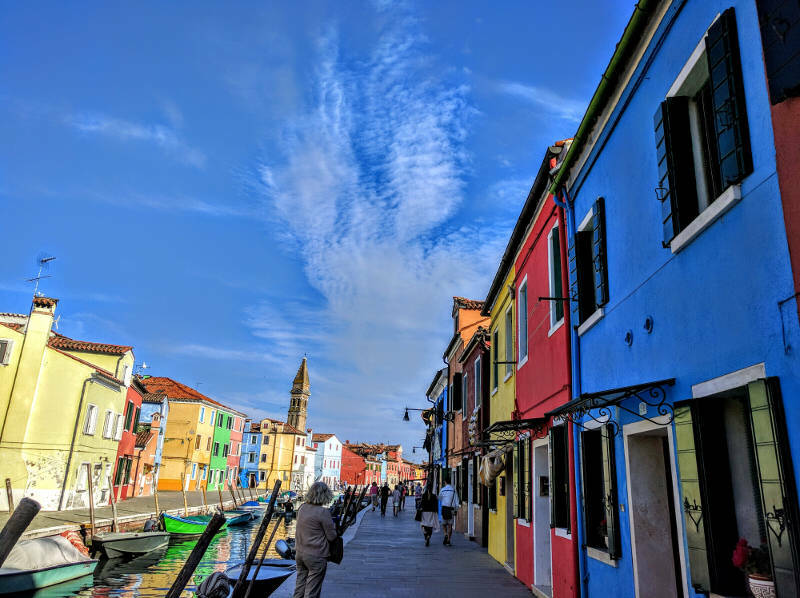 Burano is an island in the Northern Venetian Lagoon, 11 Km northeastern far from Murano and Venice, to which it is connected by the Canale Bisatto - Canale Carbonera - Scomenzera San Giacomo's trail: this route from Venice to Burano takes 45 minutes by boat. This island is easily reachable also from Treporti (10 minutes) and Punta Sabbioni (30 minutes), two Cavallino-Treporti's resorts which overlook on the lagoon. Today in Burano there are around 3000 inhabitants, while the total number of people living in Venice and its islands is about 60000. 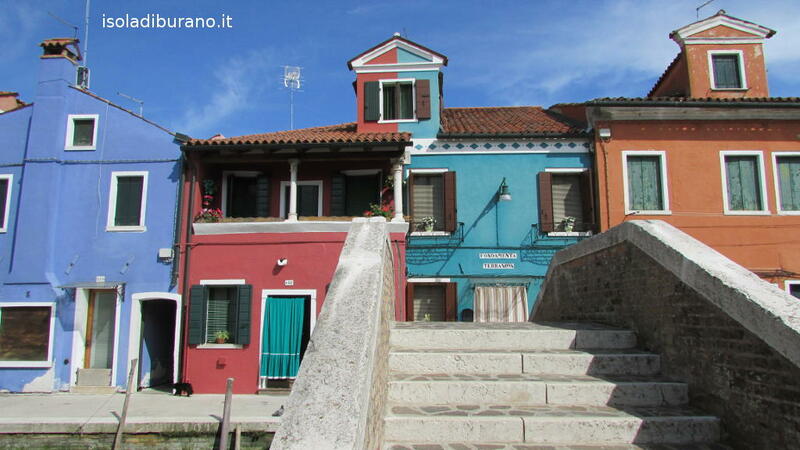 If you're going to visit Burano, you can find all the necessary information and suggestions on the page "getting to Burano". 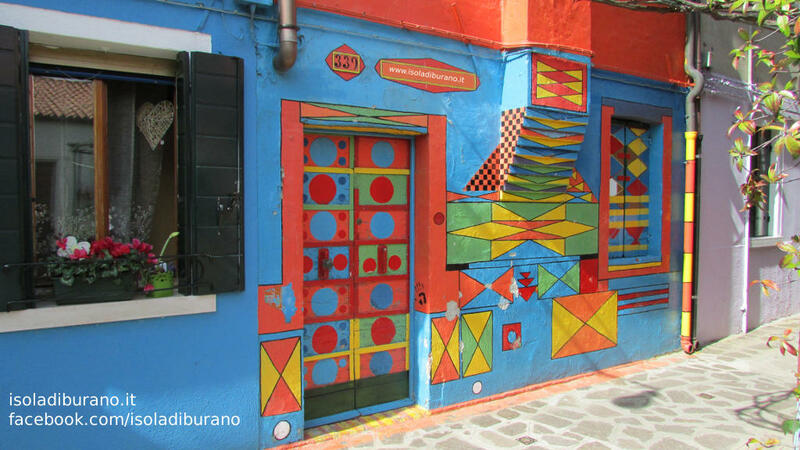 isoladiburano.it has created an useful guide with a map depicting the major attractions in Burano. 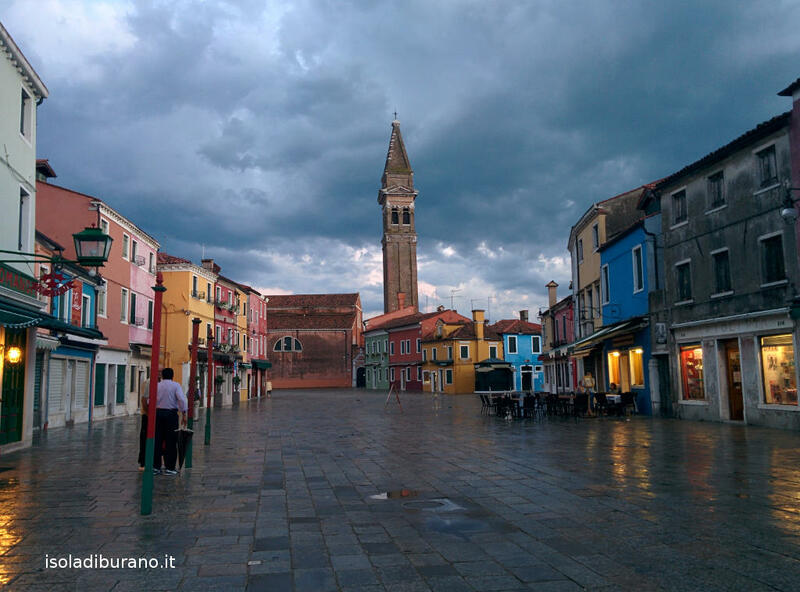 So if you're planning to visit Burano, but you're not sure where to start, do not miss our guide entitled "Things to do in Burano." 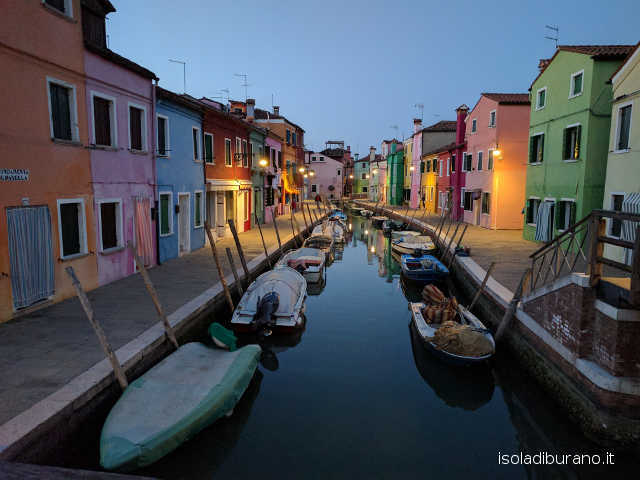 Click on the image to see a list of the best trips to Venice, Burano and the other islands, selected by isoladiburano.it and bookable online. The inhabitants of Altino, escaping from barbarian invasion, find refuge in the islands of lagoon, giving them the names of the six doors of their thrown over city: Murano, Mazzorbo, Burano, Torcello, Ammiana e Costanziaca. 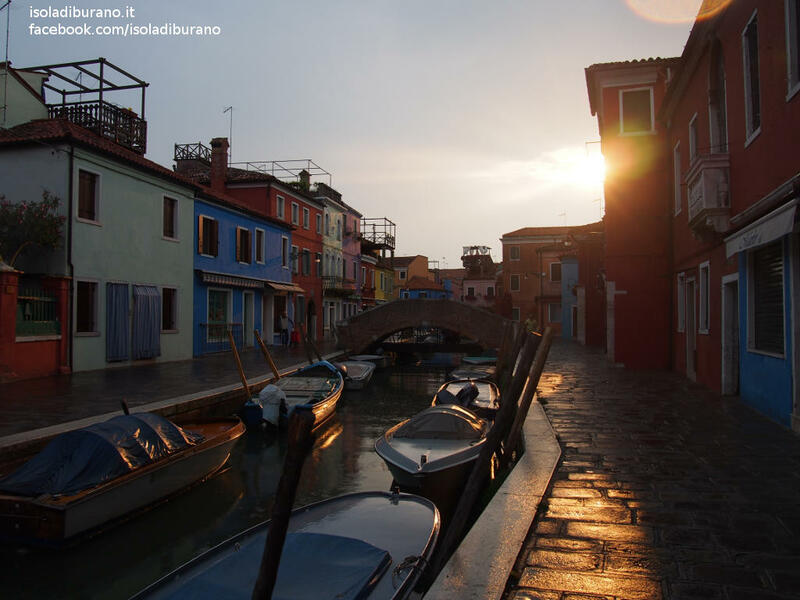 The name "Burano" arise from "Porta Boreana", the northern door of the city. In these islands the first houses were build on palafittes, with walls made of woven canes and afterwards plastered with mud. They were very light buildings constituted by an unique room, because the ground was too tender. Beds were made of dry leaves. Later these raw houses were changed with buildings made of bricks and the older ones were used like warehouses. 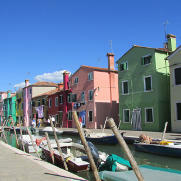 Some scholar believe that Burano was not risen where it is situated today. In some ancient text is written that the island was situated nearest the sea and that its inhabitants must escape from it because of the strong tidal wave. Instead in other texts is written which the position of Burano was never changed and which it has saved the island from malaria. 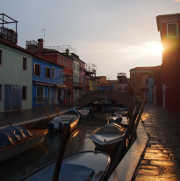 Since the time of Venetian Republic, Burano had only 8000 poor inhabitants (now 3000) predominantly fishermans and farmers. Thanks to the craft of lace workers, the island grew economically, exporting its fantastic laces all over the world. 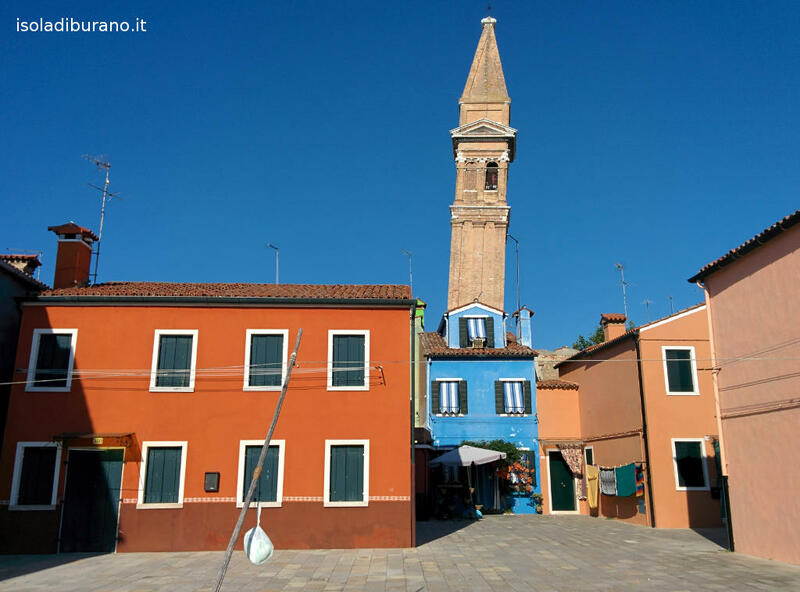 Today Burano is lotted into five joined by bridge quarters: "San Martino Destro", "San Martino Sinistro", "San Mauro", "Giucecca" and "Terranova", traversed by their mill runs "Rio Ponticello", "Rio Zuecca" and "Rio Terranova". The last big change was the principal mill run's closing off to build the square, which takes its name from the famous musician Baldassare Galuppi. 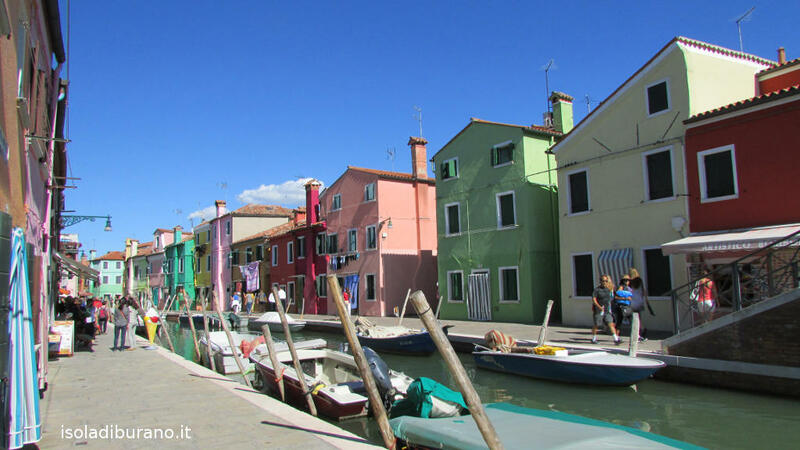 What are the major activities in Burano? 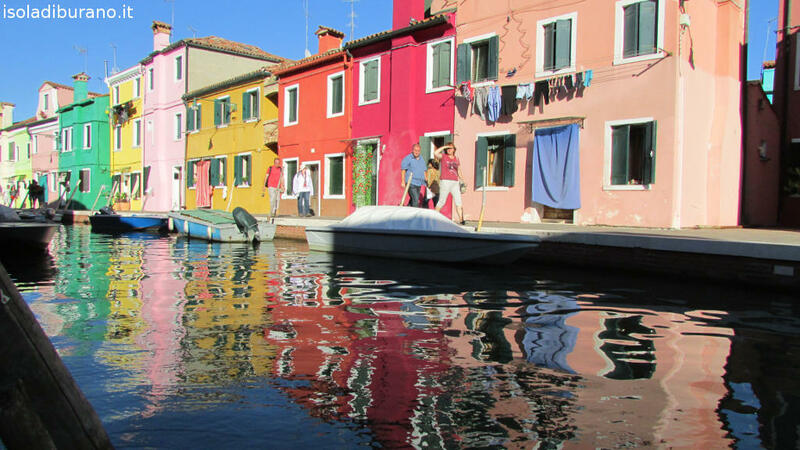 Once time ago fishing was the main job in Burano, while today is tourism besides retail trade and restaurants. 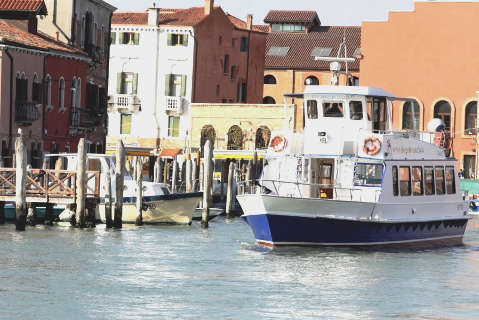 That's why this site is intended as a small tourist guide to Venice and its islands which can help you to find answers to simple questions about Venice Italy as "where in Italy is Venice". 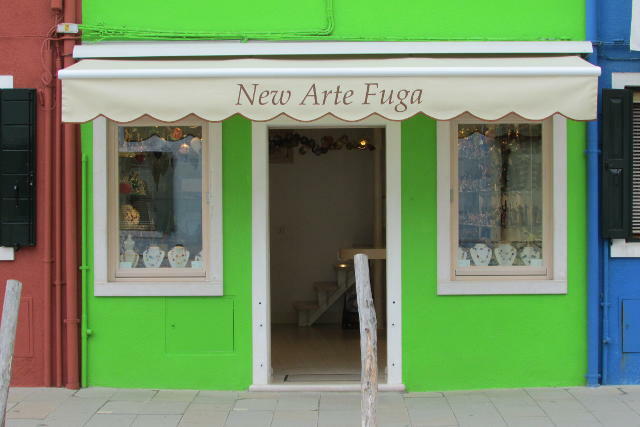 Does handcraft exists in Burano? 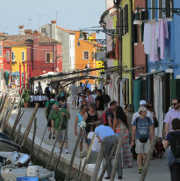 Burano is very famous for its needle lace. However on the island there is a production of venetian masks and many people work in the nearest Murano, creating precoius glass objects. A detailed section about shops will be very useful for you to plan your shopping. 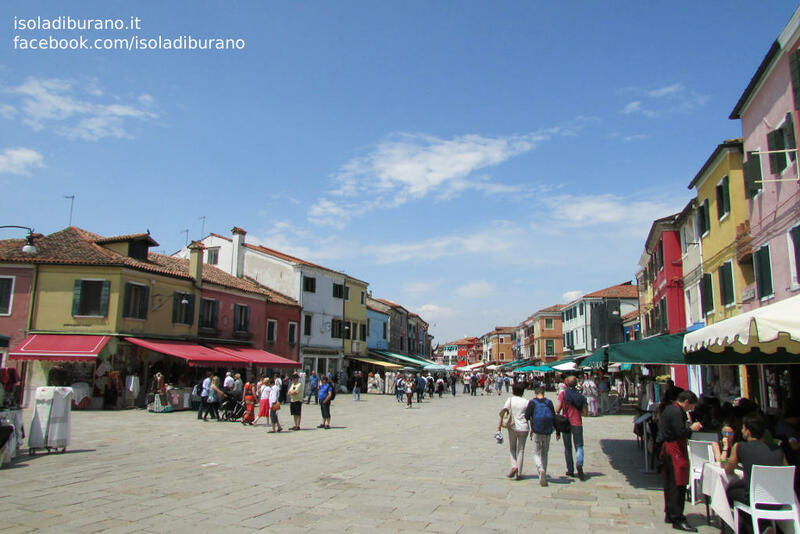 Where can I eat in Burano, Venice and its islands? 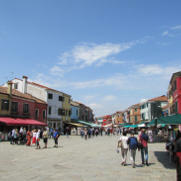 Isoladiburano.it set a section in which you can find information about both restaurants and pubs where to snack. 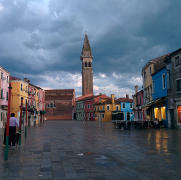 How can I find accommodation in Burano, Venice and its islands? We offer a section about accommodation in Venice islands and around them, which will follow you to choose the fitter resort for your holidays. A lot of inns, bed and breakfasts, apartments and hotels in Venice are available, such as resorts in Burano and in the nearest places like Mazzorbo, Torcello, Murano, Mestre, Cavallino Treporti, Jesolo and Abano Terme. 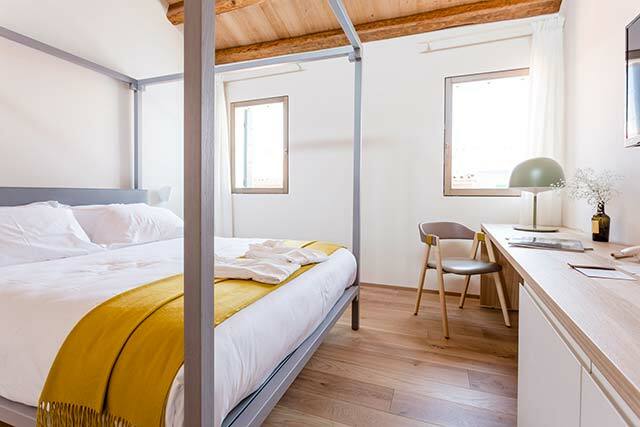 Recently you can also book apartments in Burano or your stay in a typical house of Burano, once inhabited by fishermen and lace makers, through the page holiday homes and apartments in Burano. IsoladiBurano.it and all the inhabitants of Burano wish you a good navigation ....and they hope that it will become a real holiday in our places.